The former Roma and Italy striker Marco Delvecchio, who launched a new career in television after finishing runner-up in the Italian equivalent of Strictly Come Dancing, was born on this day in 1973 in Milan. Delvecchio scored 83 goals in exactly 300 appearances for Roma, where he was part of the side that won the Scudetto in 2000-01 and where he became a huge favourite with fans of the giallorossi because of his penchant for scoring against city rivals Lazio. His record of nine goals in the Rome derby between 2002 and 2009 was the best by any player in the club’s history until that mark was overtaken by the Roma great Francesco Totti, whose career tally against Lazio was 11. Delvecchio’s talents were somewhat underappreciated at international level. 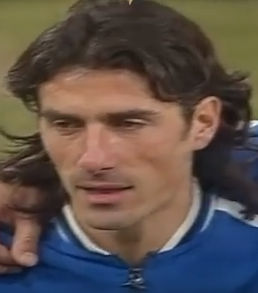 He made 22 appearances for the azzurri and the first of his four goals was in the final of Euro 2000 against France, although he finished on the losing side. Yet after being favoured by Dino Zoff, he was not so popular with Zoff’s successor as head coach, Giovanni Trapattoni, who took him to the 2002 World Cup but did not give him a game, and omitted him from his squad for the 2004 Euros. Unusually, after 17 seasons, 395 appearances and 94 goals in professional football, Delvecchio ended his career with an amateur club in the Rome area, Pescatori Ostia, for whom he scored 34 goals in one season. Three years after quitting football, Delvecchio accepted an invitation to appear in the 2012 edition of Ballando con le Stelle (Dancing with the Stars) and finished second with professional partner Sara Di Vaira. Popular with viewers, Delvecchio then teamed up with former Internazionale and Italy striker Christian Vieri in their own show, called Bobo e Marco - i re del ballo (Bobo and Marco - the kings of dance) - on satellite channel Sky Uno, in which the two ex-players went on their travels to examine dance culture around the world. Delvecchio’s TV career has continued to develop. A regular football pundit on Sky Sports, Teleradiostereo, Retesport and Radio 105, he has recently taken part in a third dance show, Dance Dance Dance, on FoxLife, paired with his 18-year-old daughter Federica. Almost 6ft 2ins (1.86m) in height, Delvecchio was characteristically strong in the air as a player but with quick feet too. Brought up through the youth system at Inter, he made his senior debut shortly before he turned 19 in a Coppa Italia match against Juventus and his first appearance in Serie A came against Fiorentina a few days later. He established himself in the Inter team after gaining experience on loan at Venezia and Udinese but was then sold to Roma, where he became a key player in a team bursting with attacking talent, playing initially alongside Daniel Fonseca and Abel Balbo and later with Gabriel Batistuta and Vincenzo Montella, as well as the emerging Francesco Totti. Trophy success came his way under the coaching of Fabio Capello, who led Roma to the Serie A title in 2000-01 and the Supercoppa Italiana later in 2001. In international football, Delvecchio was a member of the Italian team that won the UEFA European Under-21 championships in 1994 and 1996 and played for the Italy team at the 1996 Olympics in Atlanta, before making his senior azzurri debut under Zoff in December 1998. Established in the Zoff team that qualified for Euro 2000, hosted by Belgium and the Netherlands, Delvecchio was close to scoring a winner under the now defunct Golden Goal rule in the semi-final against the Netherlands, which the azzurri ultimately won on penalties, before scoring his first senior international goal to put Italy ahead in the final against France in Rotterdam, which ended in heartache for the Italians after Sylvain Wiltord equalised in the last minute of stoppage time, forcing a period of extra time in which David Trezeguet hit a Golden Goal winner for France. In domestic football, Delvecchio left Roma in 2005 and had spells with Brescia, Parma and Ascoli, where injury forced the termination of his contract and obliged him to have a year out of the game. He came out of retirement to help a former Roma teammate, Massimiliano Cappioli, launch his coaching career with Pescatori Ostia in Eccellenza Lazio, an amateur regional league. The seaside resort of Ostia, where Delvecchio finished his career, lies 30km (19 miles) to the southwest of Rome, situated just across the Tiber river from Fiumicino, home of Rome’s largest international airport, it adjoins the remains of the ancient Roman city of Ostia Antica. Many Romans spend their summer holidays in the modern town, swelling a population of about 85,000. FC Roma’s home ground is the Stadio Olimpico, the largest sports facility in the city, located within the Foro Italico sports complex, north of the city. The athletics stadium for the 1960 Olympics, the structure belongs to the Italian National Olympic Committee but is primarily a football stadium. Roma are joint tenants with city rivals Lazio and the ground also hosts the Coppa Italia final. It was rebuilt for the 1990 FIFA World Cup and it hosted the tournament final. Originally called Stadio dei Cipressi as part of the Foro Mussolini complex, the 70,000-capacity stadium has been the venue for four European Cup/Champions League finals, two European championship and one World Cup final, in 1990, as well as numerous high-profile athletics events.